Yesterday I spent the day sketching in beautiful Arrowtown. This historical gold mining village is filled with many restored buildings and miner's cottages. With a population around 2000 now, back in the 1860's at the high point of the gold rush, this town had a population of around 7000 and was the centre of the larger municipality. Now it's really mostly a tourist haunt. At least for those tourists who venture a little out of the mecca of nearby Queenstown. It may be a bit touristy, but I still love it and visit often. It's very quaint, beautifully restored and has lots of quiet nooks. For a sketcher who loves architecture and old buildings (me!) it's one of the few places around my home where I can get my 'fix' - New Zealand not having the very long history Europe has. Because I'm way out of practise with my urban sketching, I was slower than normal and only managed to finish 2 sketches. But I'm not going to let it be too long before I go back. "Crazy Poppy Heads" and "A New Dawn", paintings I did a few weeks ago, need a companion I think. I've been wanting to paint Foxgloves for quite a while. Around here these grow wild in shady places and are pink, yellow or white. What I really love about Foxgloves is looking deep inside and studying the dots. These are meant to be intriguing to bees. Perhaps I'm part bee? I've been writing quite a bit on this blog about where I live and how it inspires many of my abstract landscape paintings. While I'm not a photographer (perhaps that's why I paint! ), I took some photos on my bike ride along the lake this morning to share with you so that you can get an idea of the beautiful place I live in. As you can see we're having a very dry summer. The grass is very golden at the moment and the sky very blue. Those clouds are not going to rain. Plenty of water in the lake, though. We're having a drought in Central Otago, New Zealand. It's not official yet, but locals and farmers know that it hasn't been this dry since 1998 or so. The grass on the fields is golden, full of yellow daisies, the far hills brown with purple shadows, the snow capped mountains seem to recede into the endless blue sky. It's hot and often windy, calm days are "a scorcher" (a Kiwi term). It's a great summer if you're not trying to farm anything. I knew when I started this painting I wanted to have a large yellow field in the foreground, and a big blue sky. And although I wanted to include the lake and hills we have here, I wanted them to be a much less dominant part of the composition. 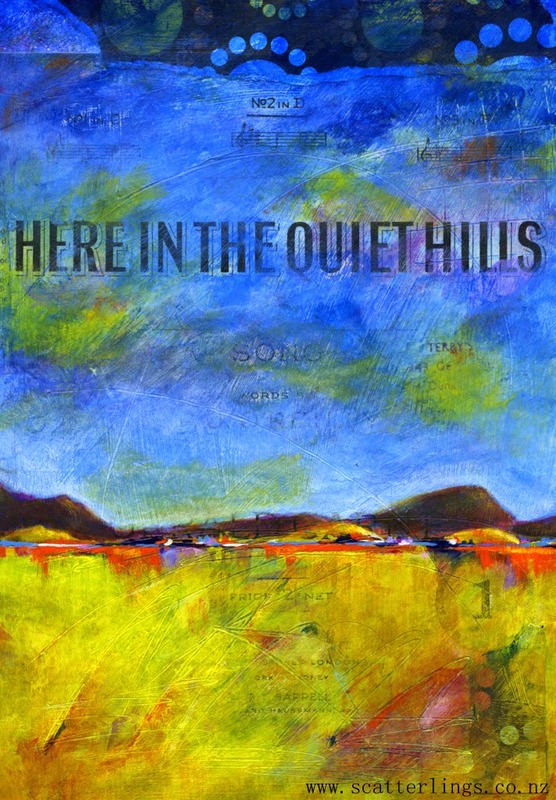 Painting "Here in the quiet hills"
Adding the abstract landscape. I knew I wanted a large yellow field, with a very big sky. "Here in the quiet hills" - mixed media, abstract landscape on wood. "Here in the quiet hills"
Visit the Scatterlings Society6 Shop for a range of products featuring my artwork. The quality of these goods is fantastic! 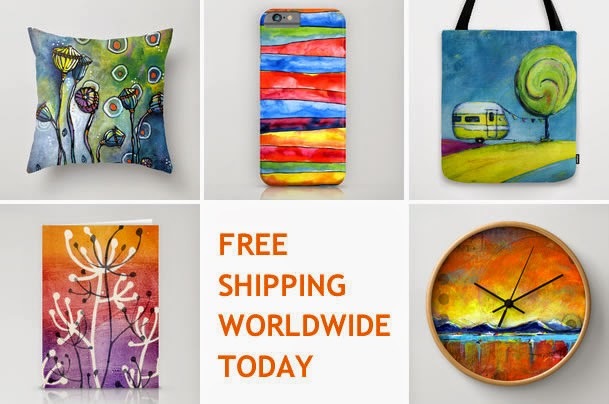 And there is free shipping today only. I'm working on my next mixed media piece. Another abstract landscape over collaged vintage papers on the back of an old placemat. Then I added multiple types of texture with acrylics mediums and found items. Then many many layers of colour. 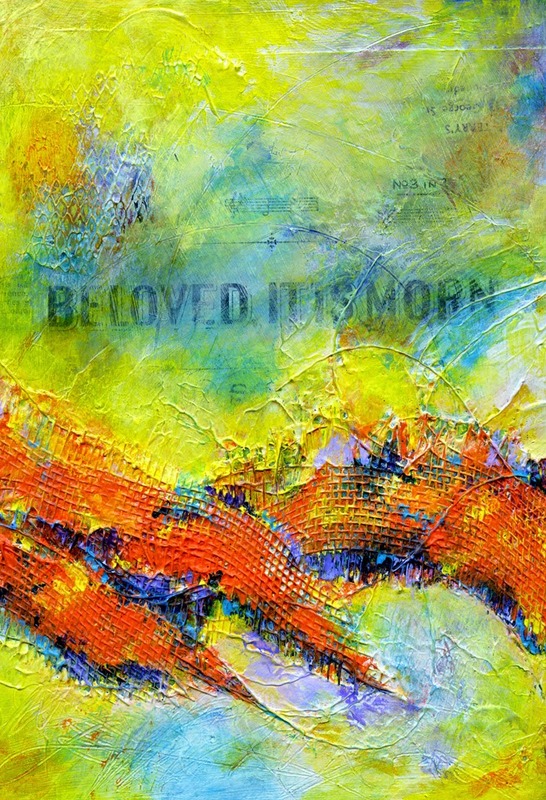 "Beloved, it is morn" - layers of paint and texture added. Still in progress. More layers of colour to come. When I was a teenager there was this TV programme called Airwolf. I'm not sure if anyone remembers it. It was about a pilot with an amazing helicopter that was a hero saving someone new each week. Mostly I can't remember exactly what it was about, but what sticks very well in my mind is that each episode ended with the hero retiring back to his lonely log cabin on the shores of a beautiful alpine lake and sitting on the jetty playing his cello. It was back then, living in a big, crazy city, that a dream was born for me. I knew I wanted one day to live in a log cabin on the shores of an alpine lake. When my husband and I immigrated to New Zealand we found those lakes. And while we still don't have the little log cabin, we do live in a tiny town on the edge of a lake. We've left the cities behind and are surrounded by crystal clear blue waters, mountains, golden tussock hills, big skies and lots and lots of space. Capturing the feel of Central Otago, where we live, is an ongoing theme for me. The colours here are so unique - golds, turquoise, yellows, oranges, and reds contrasted with big blue mountains capped with white snow. The scene I've painted here isn't an actual place, instead it captures the feeling of my backyard, the place I call home. Detail of "When you come to the end of the day"
I'm still working on my "In My Backyard" series - paintings reflecting the beautiful environment around me. And when I spotted these large, prickly, beautiful scotch thistles while walking my dog the other day, I knew I had to pick some (actually I got my husband to do it - ouch!) and do a painting in the style of the Crazy Poppy Heads of the day before. When I start to paint, even if I have an idea of what the subject is going to be, what is going on in my life comes out on the canvas and influences the final painting. How I'm feeling seems to reflect my colour choices, or position of elements, or doodles I do, or sometimes something so subtle I only notice it afterwards. My heart is on the canvas! When I'm sad and I paint, I often don't like the finished painting, even if others do - they often can't see what I can. But I also think that how they're feeling influences what they see in a painting and their response can be so different to mine. It's wonderful. For the past week I've been a little stressed and sad. I have a few friends going through some rough times, and I'm a little emotional. At first I thought I shouldn't paint, because the paintings would be sad too. But then I had a great idea - I would paint, but I was only allowed to have happy colours on my palette - turquoise, pink, purple, gold, yellow. Yes, colour therapy! Detail of "A New Dawn"
So "A New Dawn" was born. It is still rather a crazy painting, full of turmoil. But my friends are recovering and my painting is bright and riotous and, to me anyway, full of hope. Poppy Head. A slang term for someone who uses opium in any of its forms. Based on the word 'pot head' for marijuana users. Sometimes after a few days 'off' it's hard to get started again. It's a bit like being unfit. But yesterday was rainy and I had a art date with a friend. Nothing like having someone else along to get the creative juices flowing. We spread out lots of supplies across my studio floor, wracked our unfit brains about what to paint and then started by just splashed paint around. Not thinking too much. Turning off the right side of the brain. Always good fun! And then suddenly the ideas just started flowing. My friend had found these old placemats at the local recycle centre and we painted on the back of those. On the cork side. This created a new and exciting surface to work on. We worked in similar colours and both with the poppy heads I'd collected on one of my walks. It was inspiring to look across at what the other person was doing and bounce ideas off each other, offer suggestions and confidence boosting compliments - no critics allowed! When I woke up this morning, and looked again at my piece, it didn't look finished. Not nearly crazy enough for a 'poppy head'. So I added lots more doodles and colours and I'm now calling it finished. My friend left me with another mat, and I've already got an idea for the next one.